For the vast majority, a visit to the Canyon consists of a quick look over the edge, some photos, maybe a walk down the Bright Angel Trail to the first tunnel. Cap that off with lunch at the historic El Tovar, and you’ve had a pretty good day of sightseeing. But for those who venture down to the Colorado River, the Canyon reveals so much more – the vibrant colors, the rushing water falls, the massive looming wall of the North Rim. Basically, the hike breaks down into three sections: the hike down, the hike across, and the hike up. They’re all challenging in their own ways. Getting to the river and the historic Phantom Ranch can be done either on the Bright Angel Trail or the South Kaibab Trail. The Bright Angel will take you through Indian Garden, which is a pretty, green area with a small creek running through it. 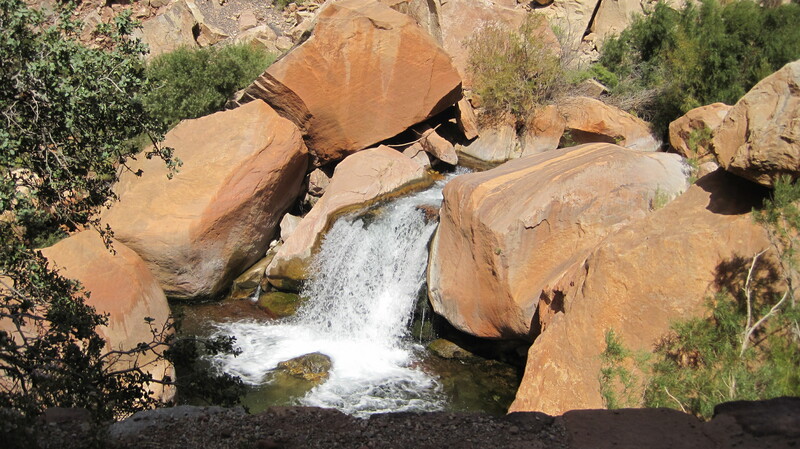 One of the advantages of the Bright Angel route is the availability of water. Rest stops with water hydrants are situated at one-and-a-half-mile intervals from the South Rim to Indian Garden – invaluable to hikers, especially on the way up in the hot Arizona sun. The South Kaibab Trail, although it doesn’t have the regular water stops, offers some of the most stunning scenery in the world (in my humble opinion!). The name of one of the first stops says it all – Ooh-ahh Point. Totaling about seven miles, the South Kaibab Trail offers a shorter route to Phantom Ranch than Bright Angel Trail’s 9.9 miles. 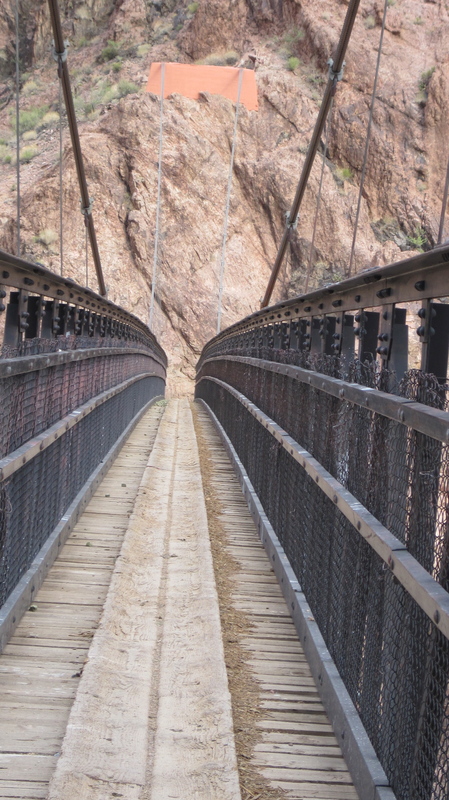 Either way, you’ll cross the Colorado River, and end up at Phantom Ranch, a cool place for a rest and refreshment. You can buy snacks and energy bars there, as well as a variety of drinks. 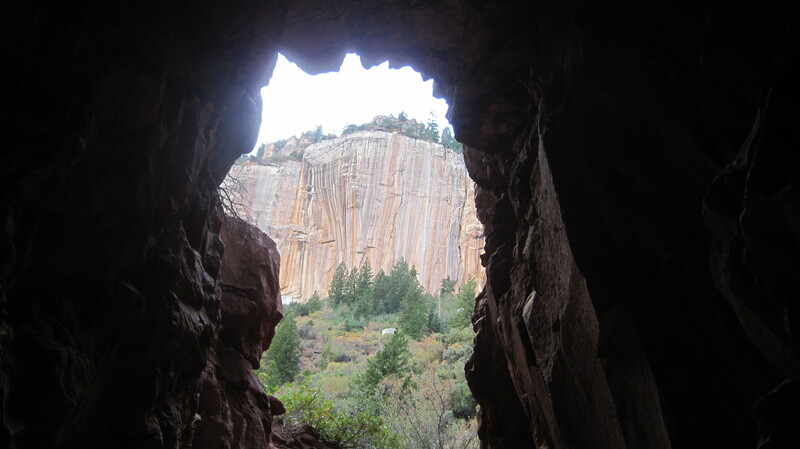 I would recommend stopping before continuing on to the North Kaibab Trail and the North Rim. 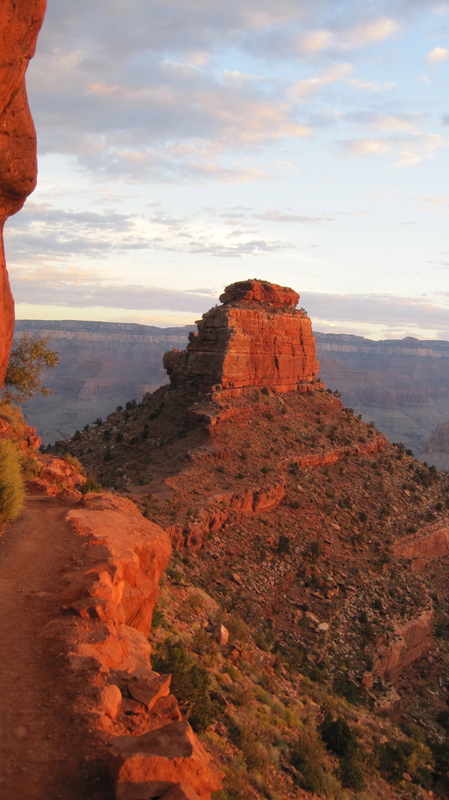 Although the seven-mile hike across the Canyon bed is not steep, it can sap your energy. Unless you got a really early start from the South Rim, the sun will beat down on you, and the trek to the Cottonwood Campground can seem endless. It’s pretty, though, with the Bright Angel Creek gurgling nearby, and it’s best to enjoy it while it lasts. Because just around the corner is the real challenge – the seven-mile hike up. By the time you reach Cottonwood, you’ve already hiked at least 14 miles. That’s a strenuous hike on a normal day. But rim-to-rim isn’t your normal day, and you still have more than 4,000 feet in elevation gain ahead of you. The next several hours will be spent focusing on milestones – Roaring Springs, about two miles up; 3.3 more miles to Supai Tunnel; and finally, the North Rim, another 1.7 miles. 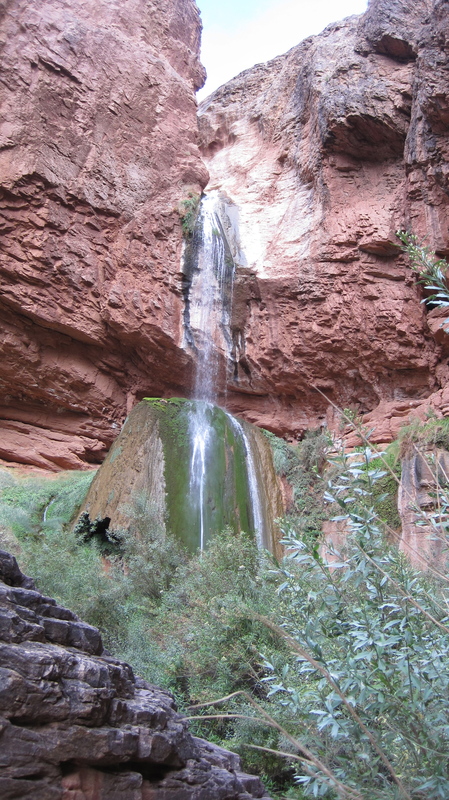 For me, the middle section from Roaring Springs to Supai Tunnel is the toughest. It’s where I start cramping up, and questioning my sanity. The last section from the Supai Tunnel adds insult to injury, but at least you know you’re nearing your destination – and the best hot shower and cold beer ever.